Updated 21 Feb 2012: Added pricing and a little more info about the pot stills. Only two months ago we were watching the US flag being hoisted above the last Irish-owned whiskey distillery. While that will no doubt lead to good things, we were also scanning the horizon hopefully for a new boutique distillery, just to keep the Irish in the game. As it happens, such a craft distillery has been operating quietly under the radar since 2000, at Longueville House in Mallow, Co. Cork. It's not making whiskey but another brown spirit: brandy. Apple brandy, in fact. The story begins with the late Michael O'Callaghan who grew grapes and produced wine on the 500-acre Longueville House estate. That proved tricky in the south of Ireland so he eventually planted 20 acres of Dabinette and Michelin cider apples in 2000. The apples are harvested in the autumn every year, and crushed and pressed in an oak cider press on the farm. The pressed juice is naturally fermented over time, resulting in a rich amber-coloured cider. This cider is double-distilled in three German-made copper pot stills (you can see them in the photo below). All three stills are used for the first distillation, and again for the second distillation. The resulting spirit is stored in French oak barrels for four years to mature. Bottled at 40%, it's vintage labelled with the year of distillation (which suggests the brandy might vary from harvest to harvest). About 1,000 bottles a year are now produced by Michael's son, William, who took over the business. 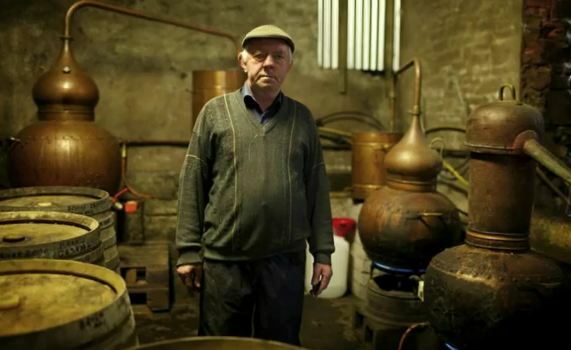 It's all very similar to the whiskey-making process from fermentation to the time in cask (whiskey is minimum 3 years). Only the source of sugars for fermenting is different - apples instead of grain. A slight variation, too, is that Irish whiskey is typically aged in casks that have been used elsewhere first, for bourbon or sherry, say. Longueville's French casks were new when first filled with the apple spirit. So how is it? (I owe a special thanks to chef Rozanne Stevens at this point for conveying a bottle from Longueville to Dublin so I could sample it.) The nose is like a slightly leathery port. The taste is salty butter, nutmeggy apple pie and a touch of aniseed. I'm getting a nice hit of strawberry jam on the finish. The spirit has mellowed perfectly after its four years in oak while the wood has not yet had a chance to overwhelm. It's really delicious. Speaking as a whiskey drinker, unschooled in brandy appreciation, I'd be very happy to drink this neat any time. Add some ice, fresh apple juice, soda water & fresh mint to a shot of brandy for a long cooling cocktail during the warm days of summer. They also mention substituting brandy for whiskey in an Irish coffee. I saw exactly this suggested in the Wall Street Journal recently. Use an Irish apple brandy and you can still call it Irish coffee, I reckon. A shot of brandy in a mulled cider makes a wonderful hot drink too. 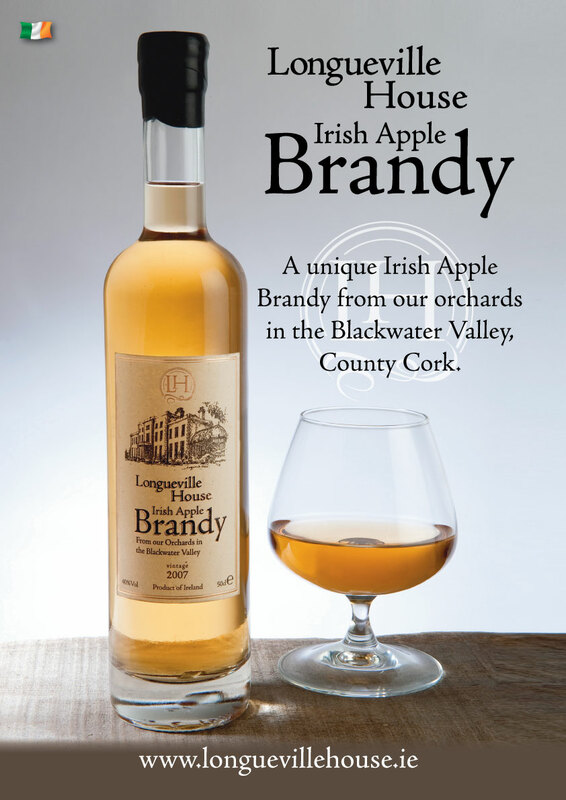 You can use Longueville's own cider for that, for it's not all diverted to brandy production. It is bottled without colourings, additives or preservatives. As if cider and brandy weren't enough, they also make infused liqueurs. A variety of fruits grown in their walled garden and on the hedgerows surrounding the farm are combined with sugar and brandy. After a period of time and three separate strainings through muslin cloth, the "Garden Berry Liqueurs" are ready for bottling. Flavours vary from year to year and include pear, blackcurrant, strawberry, raspberry, redcurrant, mint and wild plum. It's an amazing operation, isn't it? All the raw ingredients are grown and processed on site in true artisan fashion. And I haven't even mentioned the fine dining and various other activities available at Longueville House. They are setting a very high bar that new whiskey distilleries will struggle to match. They can count me as a fan, and though it's technically outside the scope of a whiskey blog, I'll be following the Longueville Apple Brandy story closely. It's available, by the way, in Redmonds Off Licence in Ranelagh, Dublin, and in Bradley's Off Licence, North Main Street, Cork. It should be stocked in more outlets soon. The recommended selling price is €35 for a 500ml bottle.